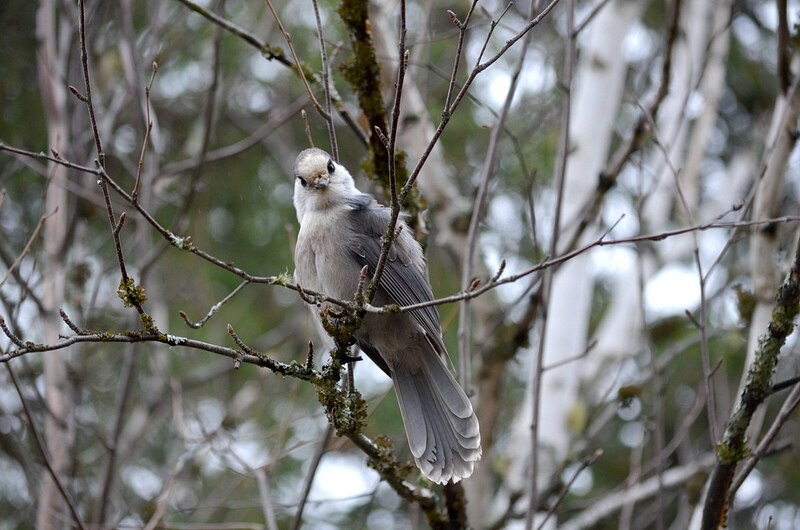 Who can resist the endearing face of a chubby Canada Jay or Gray Jay as they are more familiarly known? 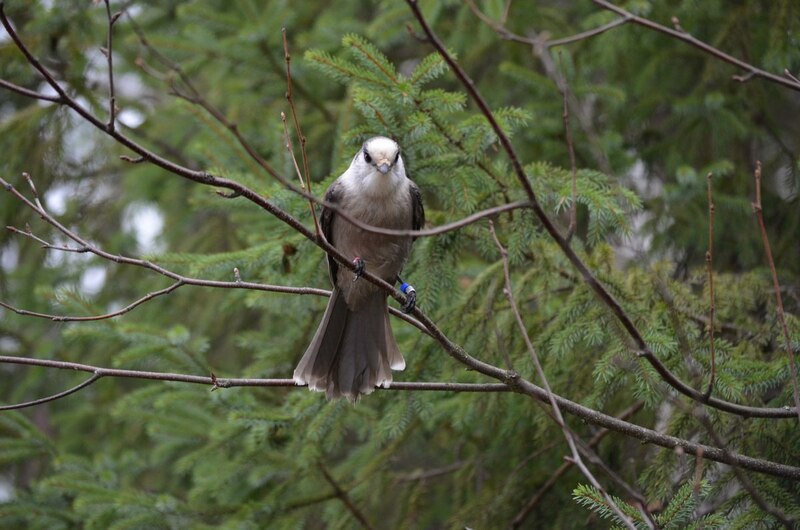 In certain areas of Algonquin Provincial Park, one is almost guaranteed to sight these friendly birds that are always quick to come close as if in welcome to their territory, the boreal forest. Now that winter is upon us, I usually make sure to carry a small bag of mixed bird seed when I visit local conservation areas, and that meager supply of seeds was barely sufficient to satiate the numerous Gray Jays that appeared out of nowhere when walking along one of Algonquin’s forest trails. 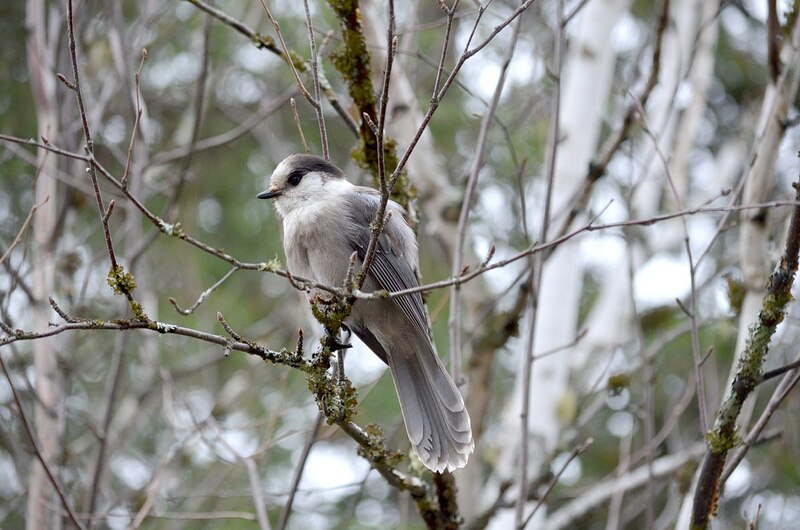 It is surprising to learn, then, that Gray Jays do not eat the seeds of coniferous trees but instead look for energy from a variety of other food sources. Their predilection for small mammals or amphibians, carrion, bird eggs and nestlings, as well as insects and arachnids, led to yet another alternate name for the species, Meat Bird. 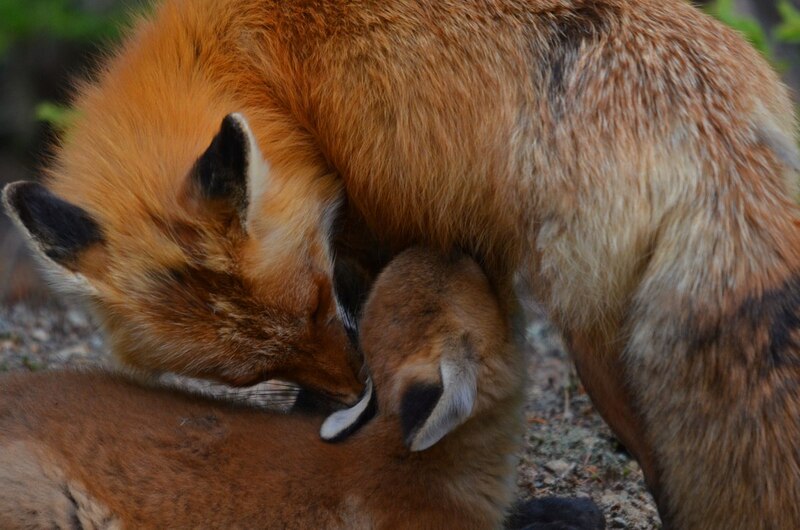 That is what my dad always used to call these gregarious birds with the soft, fluffy plumage. Looking upwards at one Gray Jay as it waited its turn at the trough gave me the perfect opportunity to appreciate the light grey plumage on its underside as well as the bird’s long tail. I have had an affinity for these birds since I was a teenager. Having arranged to spend a weekend with my girlfriend’s family who lived on the shores of Tea Lake, I was treated to a winter outing that entailed feeding Black-capped Chickadees and Canada Jays right from the palm of my hand! I was thrilled with the curious Canada Jays because they were so large, fearless and inquisitive. 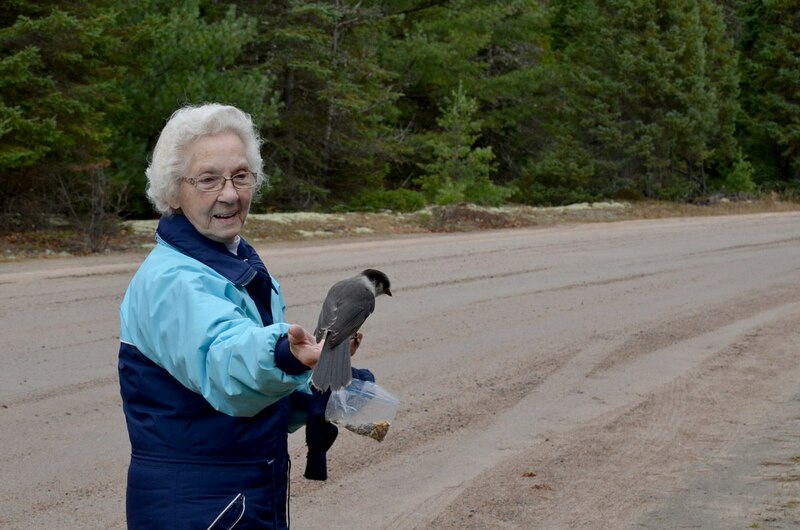 On this recent occasion, my mom accompanied Bob and me, and while I busied myself taking photographs, she was delighted to tempt the Gray Jays from the trees to her outstretched hand. 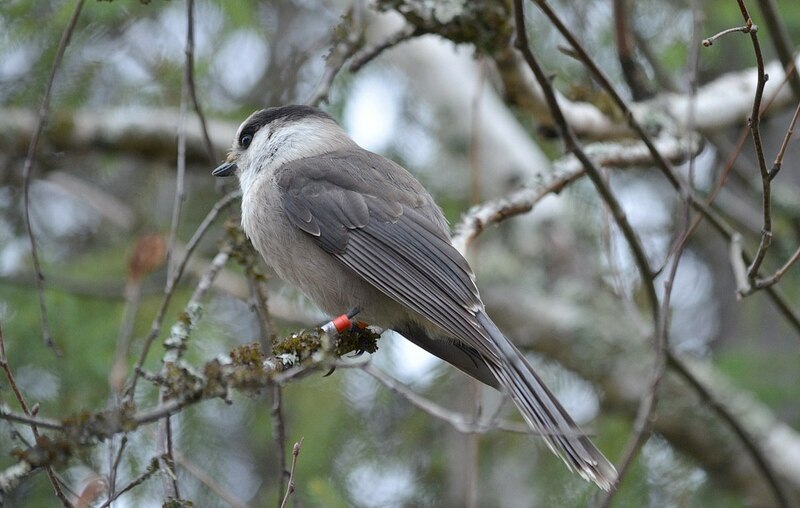 Mature birds have a dark grey back and tail while juveniles appear greyish black all over. You can see the black on the back of the Jay’s head, which is part of the unique pattern of black and white that gives the bird a slightly hooded appearance. 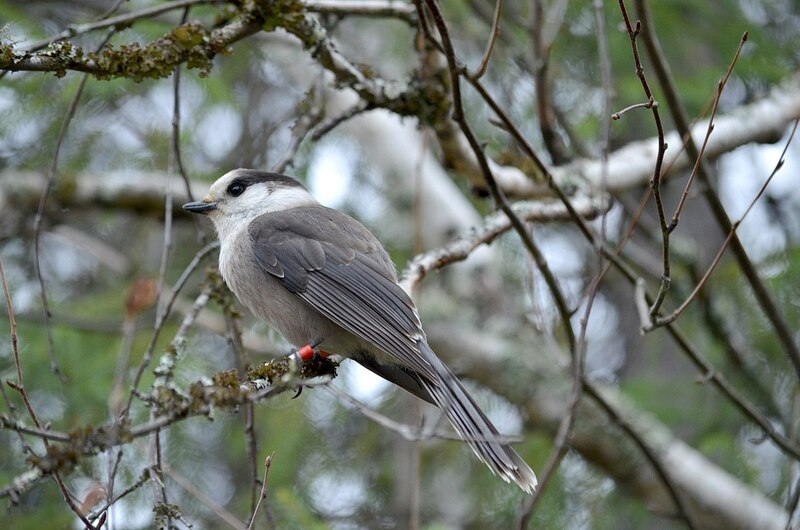 Gray Jays are able to tolerate the year-round fluctuation of temperatures in boreal forest regions of North America because their thick plumage provides the much-needed protection from temperatures as low as -40 Celsius (-40 F). These birds do not migrate but instead prepare well for long, cold winters by storing vast quantities of food that they gather throughout the rest of the year. Morsels are hidden behind pieces of bark, in nooks and crannies or even under lichen, but the savoury bits are spread over a wide area of the forest so as to avoid devastating raids by other birds and animals. Up to as many as 1,000 caches per day per bird can be secreted somewhere in the trees, and amazingly, each Jay can remember where to find all of its stashes. It is this pattern of preparation that sees Gray Jays through bleak winter months when food is in short supply, and it negates the need for migration. 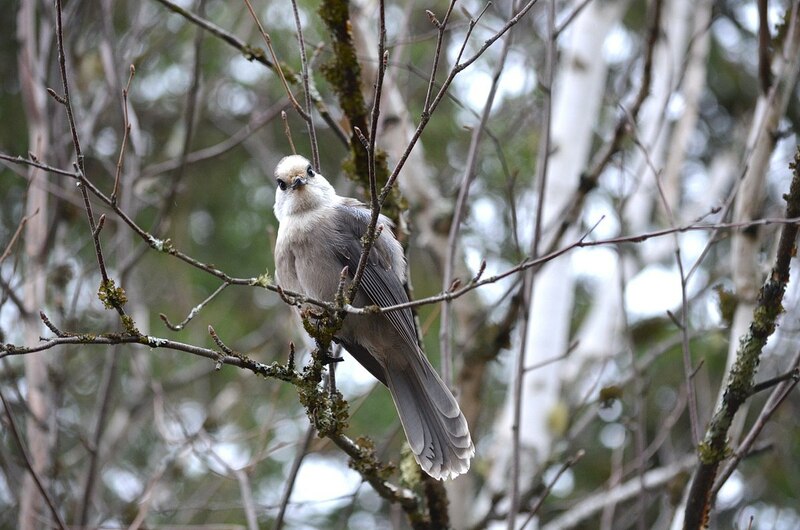 Perhaps my favorite name for a Gray Jay is its original moniker Whiskey Jack. That word has so much more character, like the birds themselves, and has an interesting history. It is a shame that Whiskey Jack has fallen out of use because these birds are the only Canadian birds to have a name taken directly from the Algonquian family of aboriginal languages to be used in English. Wiskedjak, Wisagatcak and Wisekejack are some of the aboriginal words used in Eastern Canada to denote the mischievous bird that likes to play tricks on people. Even the name Canada Jay seems more appropriate than Gray Jay. Bob and I are fortunate to live within a reasonable distance of Algonquin Provincial Park, the extreme southern limit of Gray Jays’ range in eastern Canada. During the dark winter, this species has its work cut out because that is when Gray Jay chicks hatch. The demands of the young surely tax the food stores, but the mature birds are undaunted by all that old man winter can throw at them. These large songbirds with their short, stout bill and large dark eyes will always be there to tag along when we are hiking the park’s trails.